Come bring your furry friend (on a leash) for an event that is dedicated to them! Rolling Meadows Park District will have a kiddy pool, temporary dog park, treats and lots of dog friendly businesses. Don't have a dog? Come meet some adoptable dogs from our local shelters, including Wright-Way Rescue. The fee for this event is two donation items for our participating shelters or a monetary donation. Items are as follows: dog/cat toys, dog/cat food, towels, blankets, treats. All dogs attending must have updated shots. Join Wright-Way Rescue at a Paint Your Pet class at Tap House Grill in Des Plaines on Wednesday, June 24th! Aided by our fun-loving instructors, create an original portrait painting of your pet (dog, cat, lizard, bunny, chicken, etc.) all while enjoying food and drinks! For this class, we are donating a portion of every ticket to Wright-Way Rescue. One pet per canvas. All skill levels are welcome! Are you ready to channel your inner artiste while supporting a great cause?! 1. A pre-sketched canvas of your pet if you email us a photo of your pet AT LEAST 2 days before class. Only one pet per canvas (you will only have enough time to paint one pet). We take RSVP's up to 48 hours before the class. No outside food or drinks. Minimum one drink purchase per guest. All tickets are final sale. Please double check the date, time & location before purchasing. If you need to reschedule, please check our homepage for other available classes. Hosted by Morton Grove Park District. Dogs that enjoy the thrill of the hunt, or just like to romp, can search for treats hidden in colorful spring eggs. Please consider bringing a donation item (dog food, toys, treats, etc.) for Wright-Way Rescue. When your dog touches one of the plastic eggs with his/her nose, into your basket it goes! Don’t forget to bring a basket or bag to collect your pooch’s finds. Dogs must be leashed during the event. An adult owner should accompany all dogs. Aggressive behavior will not be tolerated. All proceeds will be donated to the animals in the care at Wright-Way Rescue. Weekday class! 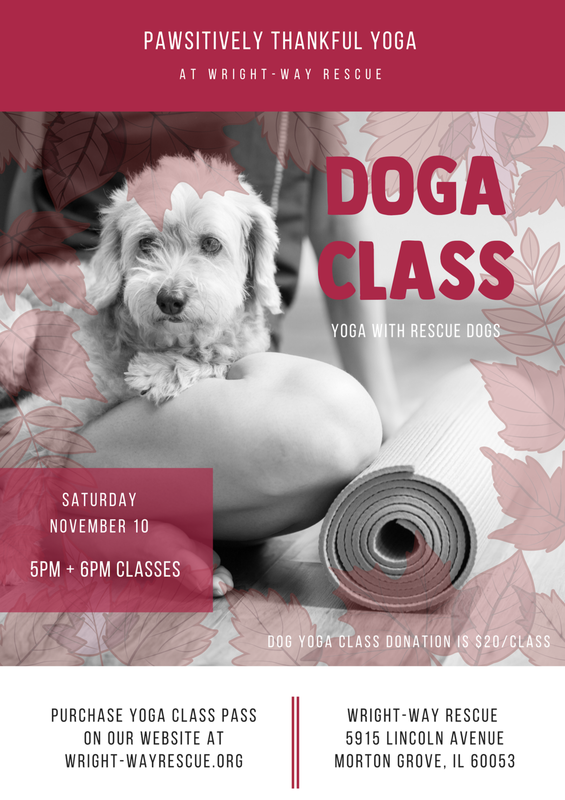 Dog lovers and fellow yogis — find serenity and come for a yoga class and rescued dogs. Choose your time slot of 4:30 or 5:30PM! 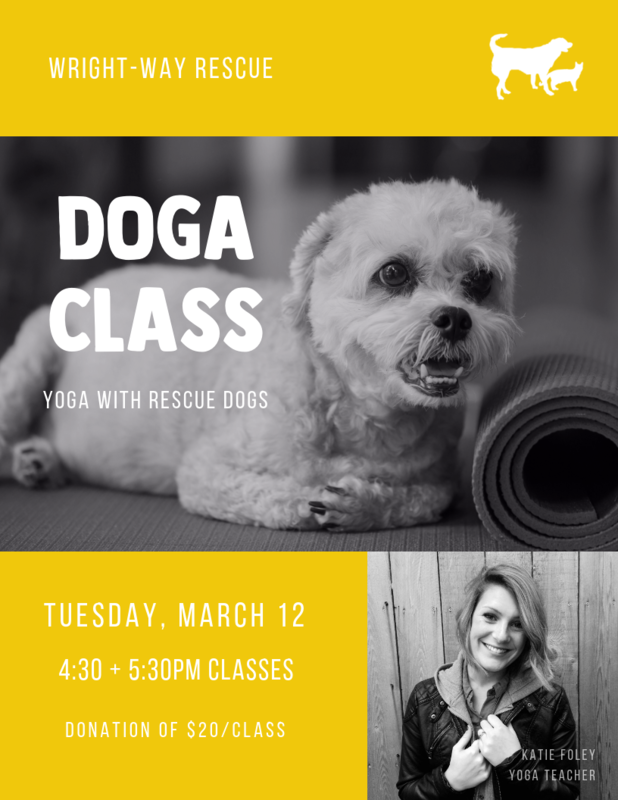 Katie Foley, Chicago area yoga teacher, is generously hosting Doga, a yoga class where you will be sharing your mat with adoptable rescue dogs, at Wright-Way Rescue's Adoption Center. Katie Foley has been teaching Vinyasa style yoga throughout the city of Chicago since 2016 and has been growing her personal yoga practice since 2008. Katie was inspired to begin teaching by her love and genuine desire to help others with their spiritual, physical, and emotional needs. Katie completed her 200 hour RYT at Chicago School of Yoga in June 2016. Katie spends her summers teaching SUP Yoga on Lake Michigan and she is an active student at the Second City Conservatory. Her background in creative arts and her love of all music and people create a dynamic flow that encourages you to have fun, center your mind, and pursue growth in your own personal yoga journey. She has two furr babies of her own and is passionate about all animals. She is thrilled to be partnering with this amazing shelter and firmly stands behind the mission of Wright Way Rescue. Join Raquel from Legit Fit and Erica from Erica's Pilates Studio as they co-lead a pilates class while surrounded by a room full of adoptable puppies at Wright-Way Rescue! You won't want to miss this stress-relieving class. Bring Your Own Mat and don't forget to grab a friend too...maybe you'll even leave with a new fur baby. Wright-Way Rescue's Affordable Vaccination Clinics are offered on select Saturdays from 2:30-4:30PM at the Wright-Way Rescue Veterinary Clinic. All Affordable Vaccination Wellness Packages and vaccinations will be available on these Saturdays at the Wright-Way Rescue Veterinary Clinic located in Morton Grove. Visit the Wright-Way Rescue Adoption Center on Saturday, December 15 from 11AM-4PM for pictures with Santa! Pets, families, and kids welcome! We will have hot cocoa and a bake sale on site, too! Wellness Packages and vaccinations will be available every Sunday at the Wright-Way Rescue Veterinary Clinic. Located next door at the Wright-Way Rescue Adoption Center. Wright-Way Rescue invites you to a #GivingTuesday celebration. On Tuesday, November 27, Wright-Way will celebrate all of the animals saved by our organization. 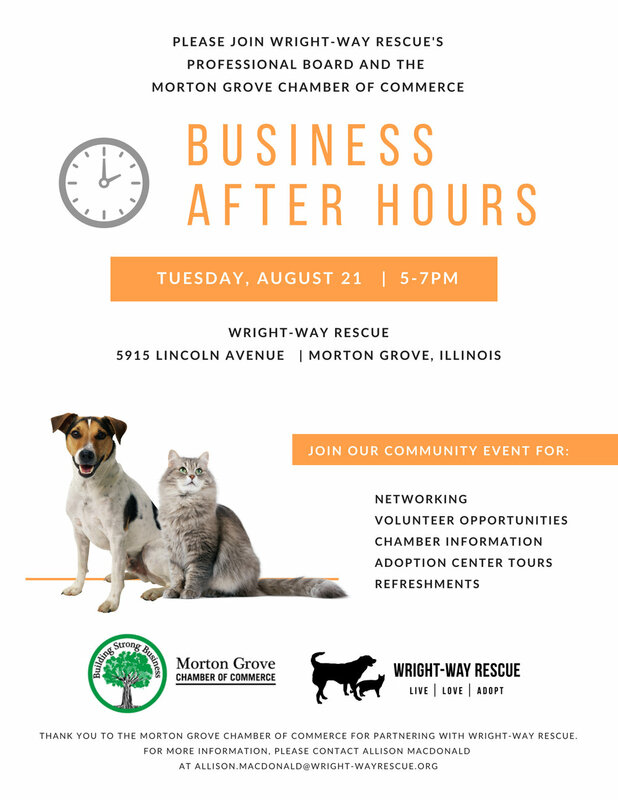 Hosted by the Wright-Way Rescue Professional Board, we hope you will join us for an evening of beverages, snacks, Adoption Center tours, and animal meet and greets with our adoptable pets. This is a free event. Please honor animals this Giving Tuesday by giving back and donating to our $15,000 goal. Your generous end-of-the-year donation will help us save lives and offer second chances. It's back! It's the time of the year to be pawsitively thankful. Dog lovers and fellow yogis — find serenity and give thanks with yoga and rescued dogs. These events will be held on Saturday, November 10. Choose your time slot of 5PM or 6PM! 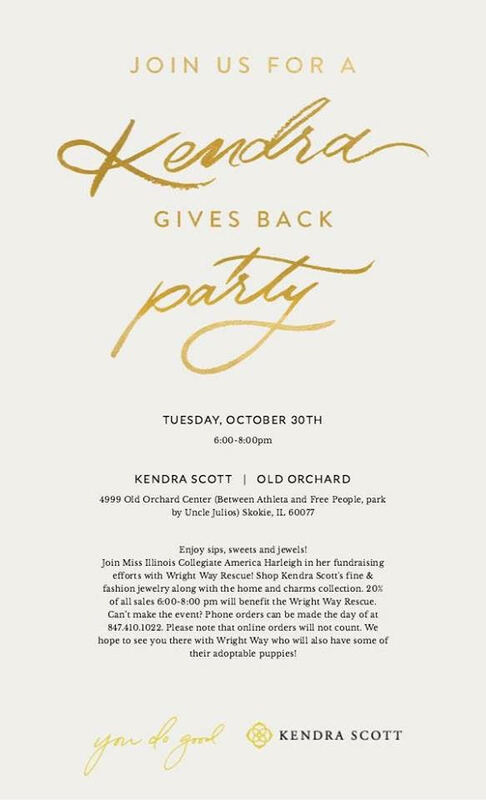 20% of all sales from 6-8PM will benefit Wright-Way Rescue! Help support Sophia's Mitzvah project to benefit Wright-Way Rescue! Her and her friends will be making some great treats! The Bake Sale will be outside of Wright-Way Rescue's Adoption Center at 5915 Lincoln Avenue in Morton Grove, IL. If you can't make it, you can donate to her fundraiser here. Jon Wright-Way Rescue at a Paint Your Pet class at Firehouse Grill in Evanston on Wednesday, October 17th! Never painted before? No problem! Email the organizers a photo of your pet at paintyourpetandsipRSVP@gmail.com and they will trace your pet photo on your canvas for you. They are donating $10 of every ticket to Wright-Way Rescue. A pre-traced canvas of your pet prior to the event if you RSVP with your pet's photo. $10 per extra pet (two pets maximum per canvas). Want to add a costume to your pet? It is an additional $7 to turn your pet into a Halloween-themed portrait! All art materials provided including easels, canvas, paint, a variety of paint brushes, palettes etc etc. 3 hours of painting and instruction by our fun-loving instructors. Not a painter? We will help you every step of the way to create the purr-fect masterpiece of your pet! Each ticket will also be an automatic entry for a chance to win a pet portrait painted by Trina! We will announce the winner at the end of the class. Once you have purchased your ticket, finish RSVPing by emailing your pet's photos to paintyourpetandsip@gmail.com. Head shot or face photos will work best. If you would like us to add a costume to your pet's sketch, it is only an additional $7. Title your email "10/17- Paint Your Pet & Sip Wright-Way Rescue". This class is in the upstairs area of the Firehouse Grill. It is not handicap accessible. No outside food or drinks (Minimum one drink purchase per guest). Join us for a perfect day on the golf course and help support Wright-Way Rescue! The goal of this scramble is to raise funds for an expansion of the rescue facility, in order for adult dogs to enjoy more freedom during their time at the shelter. Your involvement and participations means that more dogs and cats have a chance at living a happier, more interactive life and thus finding their well deserved forever family! Your support is much appreciated and we hope you join us for a PAW-SOME day on the course with a great silent auction, all you can eat and drink and much more! To sign up, please follow the link here. For questions, please contact Flo at (618) 490-1222 or send a message on Facebook! Join Wright-Way Rescue for two special screenings of PICK OF THE LITTER. A portion of ticket proceeds will go to benefit pet adoption. Come early to see adoptable dogs in the Music Box Lounge! Join Wright-Way Rescue and Lambs Farm for Fall on the Farm, a family-friendly event September 29 & September 30 at Lambs Farm! Fall themed crafts and activities include paint a pumpkin, sand art, face painting, ring toss, basket toss, pumpkin roll, face painting, temporary tattoos, decorating a cookie, craft kits, activity sheets, bounce house, tractor barrel train ride and more. Steve Belliveau, Balloon Twisting, will be available from 12pm-3pm too on both days! The Lake County Farm Heritage Association will be on site with tractors for kids to touch and go for a ride in a barrel train! Dog lovers and fellow yogis — find serenity and get your om on Saturday, September 22. Choose your time slot of 5PM or 6PM! Sing to Save the Pups! Enjoy singing karaoke under the city lights as the 100 foot vessel cruises down the Chicago River and out to the Lake! Boataoke 2018 is an effort to raise money for Wright-Way Rescue. Dog lovers and fellow yogis — find serenity and get your om on Saturday, August 25. Choose your time slot of 5PM or 6PM! The 3rd annual Family Peace Fest on Saturday, August 25 is a continuing effort to encourage peace, hope and harmony in an ethnically and culturally diverse area - Morton Grove and surrounding communities. The activity will take place outside of and behind the Civic Center at 6140 Dempster. The adjacent Farmers' Market will be happening concurrently. Join Wright-Way Rescue for the Pups for Peace Walk, a dog walk, at 10:30AM. From 12-1PM, the event will have several speakers - headlined by Maudlyne Ijirehika (Urban Affairs reporter for the Chicago Sun-Times), a Peace Poem, and a closing Peace Dance led by the square-dancing group the Glenview Squares. Wright-Way Rescue is proud to be in attendance of the 2018 Rock the Fox Music Fest and Carnival! Come by our table and say hi on Sunday! Join the Morton Grove Park District for a morning of fun for you and your dog at Prairie View Park. Bring the whole family! There will be games and activities. Free giveaways to the first 100 dogs. All pets must be leashed, and accompanied by an adult. Owners are responsible for cleaning up after their pets. Admission is free. This event is sponsored in part by Lavitt Animal Hospital.